Things here on the home front are pretty good. The weather has cooled down to a nice autumn crisp so on our walks we need to move a little more quickly to keep warm. The current temp this weekend is a light, cloudy 73 degrees. 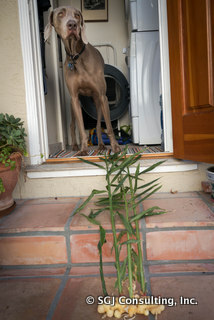 Other fun things on the forefront…Dad and I spent sometime photographing fresh ginger from the Farmer’s Market as you can see from the photo I am slowly but surely becoming a better-behaved dog. Mom says fresh ginger is good for many things besides just seasoning – it helps GERD (I’m not sure what that is but something to do with stomach issues), and morning sickness which thank goodness I will never have in my lifetime (although I do love pregnant women and babies especially). Can you believe the door is open and I am not door dashing out like in my youth. Yep- my birthday is coming up and we all cannot believe how much time has gone by and just how quickly the months turn into years. We have a new RD intern from Italy named Antonella and I cannot wait to meet her next week – Mom says she’s talented, pretty and knows how to cook yummy dishes so I’m all about meeting her! All in all, thank goodness for a calm week! Well campers things seem to be getting back to normal. At least I hope they are, but I feel movement in the air. I better appreciate the calm before the crazy holidays season starts. With this slight calmness things started to become more regular, which I like because I do not fare well when my schedule gets all out of whack. This weekend I was excited because Mom did her Farmer’s Market shopping. The Virginia Park Farmer’s market on Saturday in Santa Monica is the hit in our part of town. There are lots of fun things to see and Mom always brings me home a snack or two. I’m always bummed that I am NOT allowed at the farmer’s market as I’m sure I could pick up some scooby snacks lying around but that’s the rule – no canines allowed. After Mom got home and was out of the room I wanted to see what she brought me back in her bag. I love when I see that bag, as it is full of healthy, tasty treats like fruits and vegetables. Unfortunately I was caught red-handed or should I say bag-handed and felt a little guilty but not too much. This week Dad it going to try to create healthy fried green tomatoes with pecan crust. We will see how that works out. On our morning walk I heard Dad talk about maybe handing out dark chocolate for Halloween, since it is high in flavonoids which are good for human health, but unfortunately not for canine health. Mom was a bit concerned with my possible barking at the trick or treaters but Dad said we would just sit outside and wait for them…. great I can just see it now with Dad in a lawn chair and me dressed up on parade. Now that should be a start to an interesting end of the year. Back to sleep…I have been wanting to lounge more which the units like but I think I am getting older…yep my third birthday is in a couple months. Old age is becoming on me. No, I am not talking about Lady Gaga and her Paparazzi song, or Perez Hilton gossiping about things you might see on TMZ. I am just spending a little time discussing as my human counterparts might do on occasion…those occasional “water cooler” conversations. Yep that’s right folks…the parentals went to the south for a MINT (Motivational Interviewing) Conference and I went to the country. 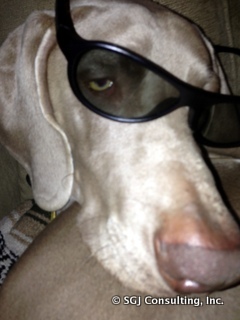 However, since I am the weather Weimaraner I thought this week I could be Perry the Paparazzi. Let’s get to the good stuff. Now of course I am reporting this via osmosis since I was not there in person, since as of yet I’ve not had the luxury of airline travel. But you know if I were there the celebs would have found me so irresistible and would have wanted a selfie with me. Sorry no photos this time but maybe next time. Anywhoo…sources close share that the Hartsfield-Jackson ATL airport was a buzz with celebrity sightings this past weekend and two stand out. Golden Globe winner and Emmy nominated actress Joanna Cassidy was spotted chatting on her phone in the Delta Lounge. The Simpson sisters, Jessica and Ashlee with their entourage, took flight from the ATL to LAX late Saturday evening. With both sightings no real fan fare but it was a sight to be seen. As for the weather it was a hot one last week here in Santa Monica, currently are at a pleasant 75 degrees. I do hear Halloween is coming soon. Do you think the parental units will make me wear an outfit? You be the judge. Be safe people and stay out of trouble or at least don’t caught by prying cameras.